Let the Florence Griswold Museum Come to You! The Museum’s artistic staff is available for educational activities presented at your location. Contact Julie Garvin-Riggs, Museum Educator for availability, an activity or a specific topic not listed below, and more information about presentations for youth audiences. The Museum is famous for its collection of beautiful landscape paintings in the styles of Tonalism and American Impressionism. Let the Museum send a Museum Educator to your site for a fun and informative hands-on art lesson. Students learn the step-by-step process of composing a landscape working on their own 8” x 10” canvas board. They experience the nuances of color theory as well as become acquainted with the tools and techniques of the American Impressionist. Some of the most influential artists to come to Old Lyme painted in a style known as Tonalism. These artists created monochromatic (one color) landscapes that were poetic and full of mystery and mood. Let the museum send a Museum Educator to your site for a fun and informative hands-on art lesson. 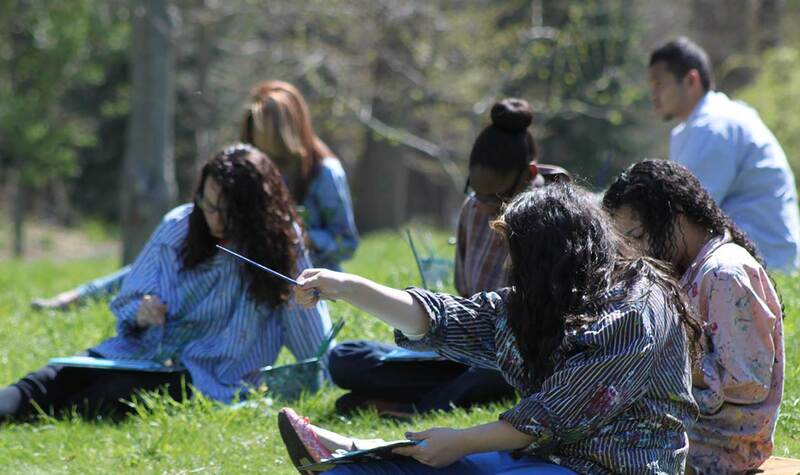 Students learn the step-by-step process of composing a landscape working on their own 8″ x 10″ canvas board. They experience the nuances of color theory as well as become acquainted with the tools and techniques of the American Tonalist. Cartoon artist James Stevenson and author/illustrator David Macaulay both told the story of Miss Florence and the Artists of Old Lyme in pictures rather than words. Students will learn the story, by decoding and discussing the images, before illustrating their favorite part of the story. 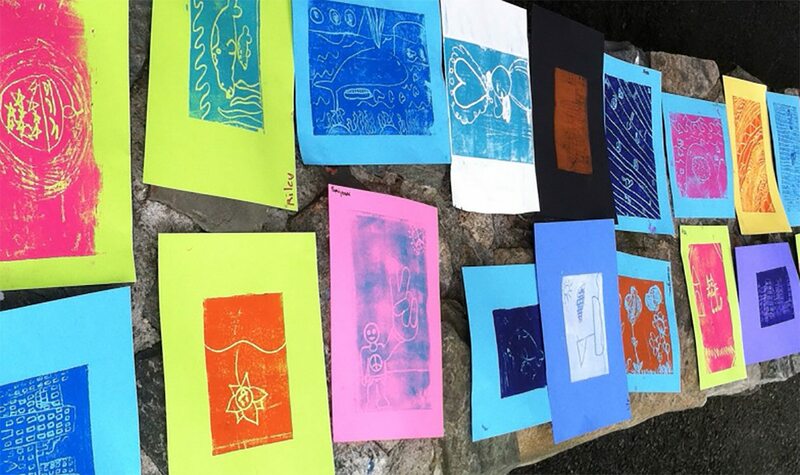 Students create foam-printing plates that transfer student-friendly paints onto colorful paper. Making multiple copies allows the class to gather one from each student into a classroom portfolio. The Museum’s professional staff is available for lectures and presentations to groups and organizations for minimal or no charge. Contact David D.J. Rau, Director of Education for availability, a talk on a specific topic not listed below, and more information about presentations for adult audiences. (860) 434-5542, ext. 115 or david@flogris.org. How does a sea captain’s gracious home become the center of a Bohemian artist colony? This visually rich presentation will introduce your group to Miss Florence and the artist of Old Lyme and explain how the small New England village fostered a new chapter in American art history. Each October, the Museum presents a creative outdoor event called Wee Faerie Village and transforms the grounds into an enchanted playground for the imagination. This presentation explains the genesis of the event as well as offers the inside scoop on the developments of the upcoming wee faerie theme. A is for art, B is for boardinghouse, C is for collection…you get the picture. Learn both the history and what’s happening this year through this fun and informative romp through the alphabet. The Museum is famous for its collection of beautiful landscape paintings in the styles of Tonalism and American Impressionism. Let the Museum send a Museum Educator to your site for a fun and informative hands-on art lesson. 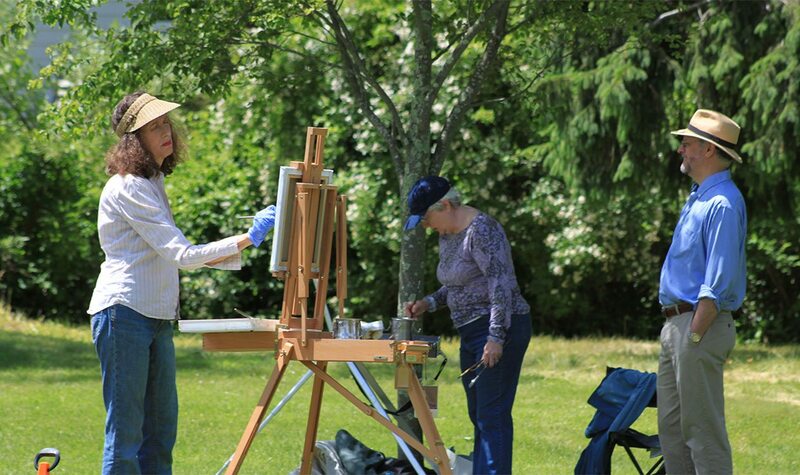 Participants will view some famous Old Lyme views and learn the basics of color mixing before trying their hand at composing a landscape painting.